Installation - Michigan Granite, Marble & Quartz countertops at affordable prices! Your countertops have been fabricated and are ready to be installed. We will need to schedule a date for installation that suits you. Once the date is booked, you will be given a two hour window in the morning or afternoon when our installers will arrive at your home. We ask that you are home to supervise the installation process. Once the job is complete we require the remaining payment. This payment is due no later than on the day of the installation. Our installers carry portable card scanners in case you want to pay with a credit or debit card. We will install the countertops, drill the faucet holes and attach the sink. If you have a current countertop on your cabinets, please make sure it is removed and the sink and cooktop are detached. We do not specialize in plumbing and electricity nor we are licensed to do it. Once our installers are finished, we ask you to check their work so that it meets your standards. Installing your countertops usually takes one to four hours depending on the size and complexity of the project. The first thing the installers will do is choose the best approach to bring in the countertops into your home. We ask that you cover your floors, as our installers are required to wear steel toe boots for their safety when carrying granite. If your countertops need to be glued down, we ask that you keep your pets away from where our installers are working to avoid the vapors. Once the countertops are in place, a second coat of sealant will be applied along with silicone where needed. We strongly recommend that you do not hook up the plumbing for at least 12 hours to allow the adhesive to dry completely around the sink. 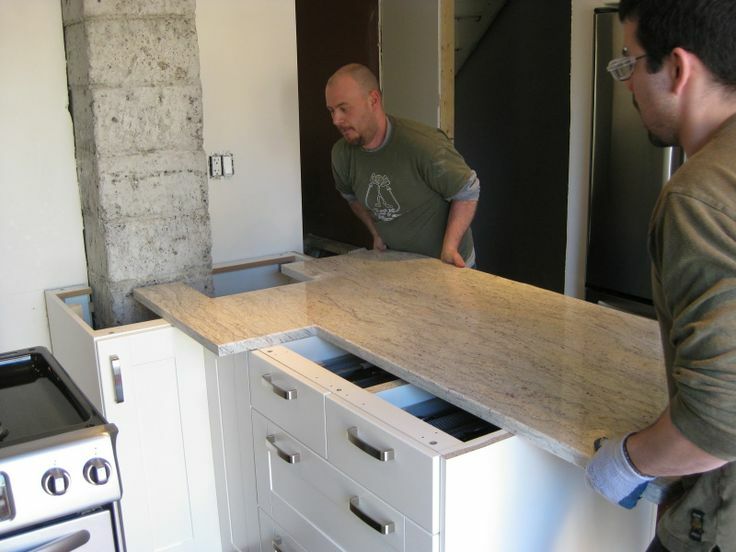 Our installers are highly trained and have many years of experience in installing countertops . When dealing with seams we mix color in the glue compound applied to the seam to ensure the least visibility. We do our best to put the seams in the middle of the sink when necessary. We put a lot of effort in training our installers to pay close attention when bringing the countertops into your home so that nothing gets damaged in the process. The installers were very courteous and respectful. They did a great job! I am very pleased with how my countertops turned out , the installers were very nice and did a very good job. I will definitely recommend you guys to all my friends my kitchen looks amazing now!